Happy Friday friends! Isn't this a cute dress? It's so comfortable, too! I found it at TJ Maxx recently, but ultimately decided to return it as it's not something I need. I'm trying to shop smarter and keep frivolous purchases to a minimum. I hope you have a wonderful weekend and thank you so much for dropping by! Love love love the dress and heels!!! 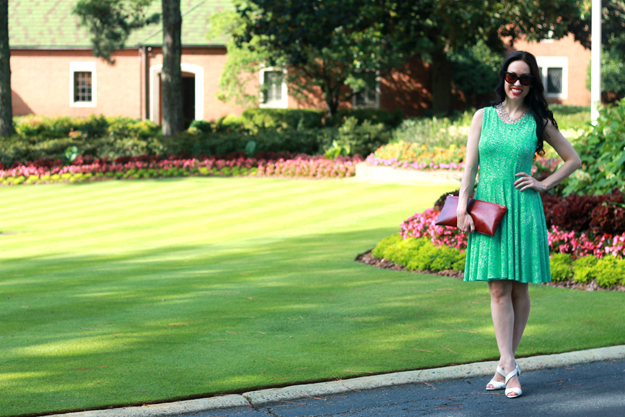 LOVE the second photo and this super bright green dress! So pretty! Great heels too! From far away, it looks like a sparkly skater dress! I did not know it had a print to it! It looks great on you, but I agree with shopping smarter - I have a problem with buying too many of the same stuff. Mary Ann, you are STUNNING. You look like you are straight out of a magazine, and that dress is adorable! wauw, the colour of your dress is so pretty! really love your outfit, you look wonderful. I'm in the same boat as you Mary Ann.. wear more, shop less kind of diet haha! So far not too shaby, I'd say :) Good weekend ahead, gorgeous! ur blog is so cool! what do u think of followin each other? Oh my gosh loving your sunglasses! Super cute!! You look beautiful. Yes, dress is super cute. ohh dear!so pretty!really amazing dress!! That dress is gorgeous, Mary Ann, and you look so beautiful! Have a weekend! I've been SOOO into bright green lately! You look great! Fantastic joyful photos! Love your outfit! the dress is so beautiful! I'm happy to see your blog, your pictures are beautiful. Love your dress and shoes!! You got a new follower. Hi,very nice blog!Follow us if you like our blog and we will follow you too! you have a spectacular style! incredible this dress, are amazing! What beautiful pictures! You look great. I love all the green!! That dress is adorable and perfect for twirling in. It's unfortunate you had to return it, but that was good of you. And at least you got to take beautiful pictures in it first! Love this dress! I can't believe you didn't keep it - though I guess I understand, I've been trying to be more thoughtful in my purchases, too! The dress is so cute, loving the shoes, it look fantastic. Such a pretty shade of green, looks really lovely on you. This dress is absolutely perfect. The color looks perfect on you and I really love how classy your styling is. You look so classy!!! Love this look green is a good color on you!! Yay! 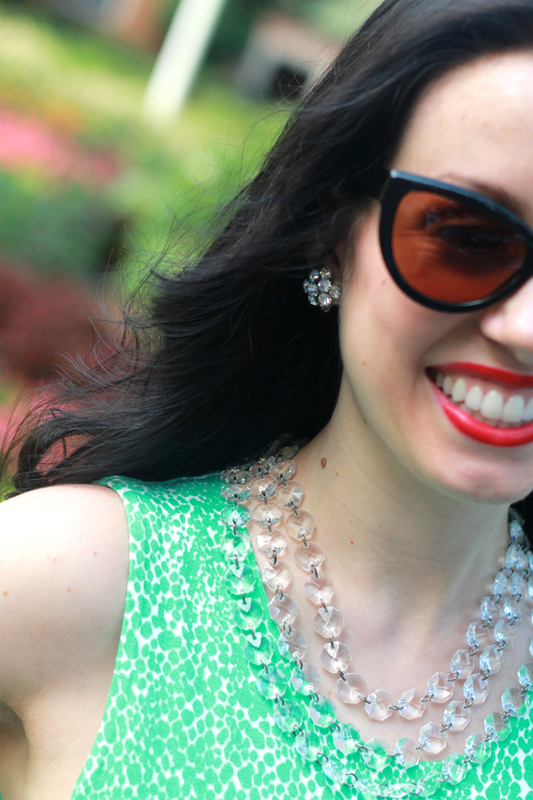 Love bright green, especially on you--I always think it looks amazing on fair skinned brunettes. That second picture of you twirling, it's gorgeous! oh this is the perfect shade of green and i love how beautiful it looks with your haircolour! a chic and beautiful look! Cute look! Love your dress and jewelry!